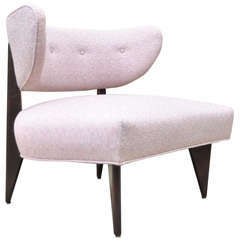 Upholstered slipper chair with channelled back over pierced bronze legs, Gio Ponti for ISA, fully restored. ISA label. These legs for ISA were exclusively used by Ponti and prized for their high quality and design. 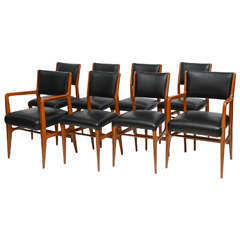 Gio Ponti, ISA International Inc. Pair of Mid-Century Modern Klismos Slipper chairs and ottoman by Billy Haines, the frames in black lacquer. 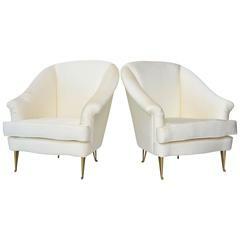 Large and imposing pair of Italian modern lounge chairs with high backs and wings on round tapering legs. 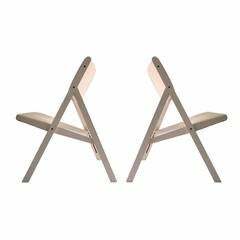 High back armchair produced by ISA Bergamo in the 1950s and often attributed to Gio Ponti. 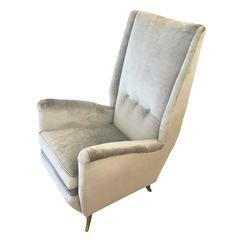 Has been re-upholstered in a light grey velvet. The feet are gold painted aluminum. 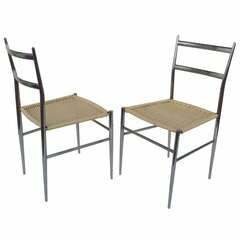 A pair of Italian chrome chairs with woven white plastic seats attributed to Gio Ponti.